Fit the horizontal and vertical rebar to the walls in all the right locations as per structural engineering. 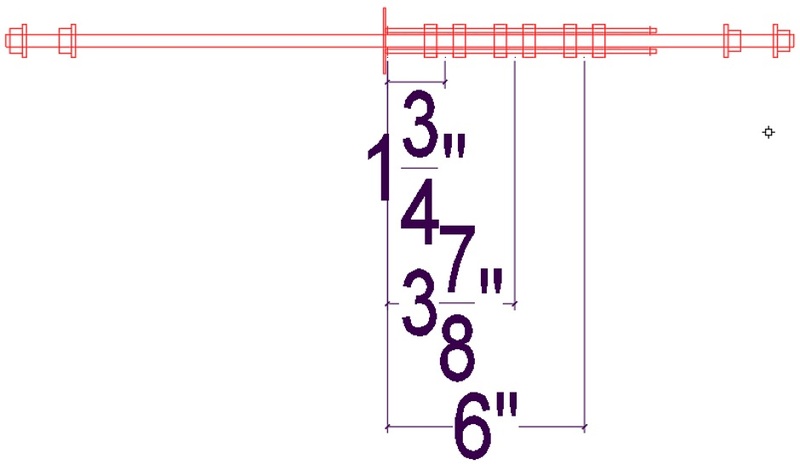 There should already be 3/8" threaded rod wall ties in all the significant positions through the outer wall EPS. The positions were chosen to provide the required support for the rebar at all the required distances up the wall. Only some of the vertical batons are fitted at this stage, but enough to support the rebar. Rebar placement should be specified on your CAD drawings and should have been added to your drawings to meet the requirements of the structural engineering process. Rebar positioning within the concrete cavity width is important. 1-3/4", 6-1/8", 8-1/4", and 10". Note that the locations given are for the horizontal rebar. The vertical rebar positions are typically offset by half an inch relative to these locations. The horizontal rebar is kept at the right position within the width of the cavity using small snap-on pieces of 3/4" conduit. The 3/4" conduit is cut on a chop saw or band saw to 3/8" lengths and then the edge is cut open on a band saw to make a gap. They can be added after the 1/2" conduit is fitted. The 3/4" conduit collars slip onto the cut to length 1/2" conduit pipe and are glued in place with a dab of regular PVC pipe glue (applied after the collar is in the right place). The collars are placed to provide a half inch gap between the two collars. A collar pair is only needed where rebar is actually required. Usually only one collar pair are needed per wall tie. It is worth making wooden jigs to help you quickly position the collars. Only add collars where rebar is actually required. Making notes on the conduit with a felt marker pen is also useful. Figuring the rebar positioning out now is better than when actually lifting the rebar into place. If the conduit does not have a 3/4" spacer fitted and therefore is loose, push it up against the EPS when using the jig. We are putting the rebar into the cavity in its right sequence relative to each other in the cavity. It is ok to tie the horizontal rebar in its right locations because the strategically placed vertical inner batons will support it ok.
At the edges of openings there will be more vertical rebar and it will be constrained by rebar stirrups. The stirrups need to be added as you add the vertical rebar. There will also be extra vertical rebar at corners. You need to make sure everything is as per the structural engineering rebar placement requirements. Don't forget the 45 degree corner pieces used at the top of wall openings. At the corners it is best where possible to use horizontal rebar with 90 degree bent ends to bend into to the adjacent wall where it can be tied to the horizontal rebar of that wall. Threading it in can be a bit tricky but the fact that there are not yet any tie rods to the 2x6+2x4 vertical corner pieces makes it easier. Throughout the building of the walls, look for opportunities to add more rebar anywhere you think it will help. Remember that the rebar placement spec in the structural engineering drawings is just the minimum required. Do the following steps for the internal walls too. It is important to first add any horizontal rebar that needs to be closer to the outside of the wall than the vertical rebar. In the case of a backfilled wall the vertical rebar will be close to the inside of the building, but then the horizontal rebar will be in the 6" position (from the outside of the concrete) closest to the inside of the wall so the vertical rebar (at 5-1/2" from the outside of the concrete) will still be nearer the wall outside than the horizontal rebar. Even with a backfilled 8" wall there will however still be some occasional horizontal rebar in the center position and this is closer to the outside than the vertical rebar, so this needs to be added first. Note that the vertical rebar positions do not correspond with the positions of the wall tie rods. These are typically at the positions where the vertical rebar comes up through the slab. Check to make sure you really have added all the horizontal rebar that is nearer the outside compared with the vertical rebar. Tie the horizontal rebar (that is further out than the vertical rebar) using strong cable ties to the conduit in the correct places. These are actually added as you add the vertical rebar. You will need to temporarily tie them in the right horizontal locations to stop them dropping down. You can use electrical tape or tie wraps to the wall tie tubes to temporarily hold them. For external walls (both 8" and 12" cavity) the primary vertical rebar always has its center 5-1/2" from the outside edge of the wall concrete (ie 5-1/2" from the house outline reference line). The calculated position is actually 5-3/4", but I have chosen to offset it a bit to provide more concrete covering for the rebar on the inside. The vertical rebar position corresponds to being just inside (nearer the center of the wall) compared with horizontal 1/2" rebar that is in the inner position on the 8" cavity plastic wall tie tube. The half inch rebar used has a bend in the end. The bend goes at the top and some length is cut off the straight end to make it fit. The bend leg at the top needs to be held the correct distance from the top of the flooring EPS. 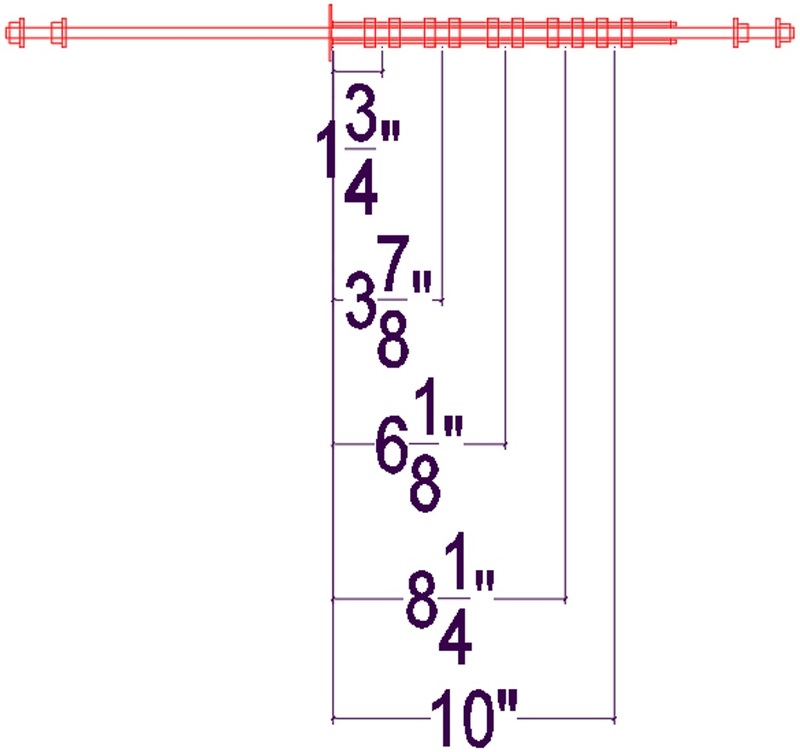 The chair height is 1.5" so for the moment you can use lengths of 2-by (cut in half long-ways to a 1.5" width). Twin screws can be used to hold the tails in the right locations. These diagrams show the calculated positions for the vertical rebar (not the actual adjusted offset positions). 2-1/4" (4-1/2") 5-3/4" (8") 9-3/4"
For internal concrete walls the vertical rebar is near the center within the 8" cavity, but a half inch towards the building center tied to the horizontal rebar at the 3-7/8" position. The vertical rebar is at the 4-1/2" position relative to the outside edge of the concrete of the internal wall. The vertical rebar does not sit in a collar pair on the plastic conduit pipe and is not even close to a tie rod. Initially you may not be able to tie the vertical rebar as it may need the inner horizontal rebar. The vertical rebar (using extension pieces if necessary) should be long enough to extend 3'6" beyond the top of the slab of the floor above. The vertical rebar that comes up above the concrete floor above needs to be fitted through holes made in the 6mil polyethylene sheet that covers the floor above. if you are using extension pieces of rebar to provide this then you can delay fitting the extensions. You want to for the moment keep the sheet over the wall cavity as it stops rain, leaves and pine needles getting into the wall cavity. Add the rest of the horizontal rebar. Tie it in the correct places. Tie the vertical rebar to the horizontal rebar. The tying of the vertical rebar to the horizontal rebar that in turn is tied to the wall ties keeps the wall ties in the right locations. In the case of the vertical rebar it is typically rubbing next to a piece of horizontal rebar and the two are tied together (the tie point is not at the plastic tube). You are relying on the friction between the horizontal rebar and the vertical rebar to hold the wall tie tube in the right vertical dimension. Having them held in the right locations will be important later when it comes to fitting the plywood sheets. Also tie the vertical rebar to the 3'6" vertical foundation rebar. For a backfilled wall with vertical rebar every 6" then only every other vertical wall rebar is tied to foundation rebar. Note that this is much better than with traditional ICF where it is not practical to tie to the foundation rebar. Tying to the foundation rebar also helps stop the forming rising up with the wet concrete pressure. All the rebar (both horizontal and vertical) has been added to the cavity in the right sequence relative to each other. It is all tied in the correct positions on the few wall ties that are currently present. There is no internal plywood on external walls so it is still possible to get your hands into the cavity. Internal concrete walls have plywood on the outside face (but not the inside face) and the internal wall rebar has also been added. This involves drilling holes in the EPS because it is actually a secondary location. Add the washer and conduit on each piece of threaded rod. On the inside corners of walls there is a 2x6+2x4 vertical corner assembly that is already in its final position. The tie rods for this use a secondary position so holes in the EPS need to be drilled. Put a vertical 2x4 baton on the outside of the 8" EPS wall and hold it in position using 3 outside horizontals attached to the existing 2x4 outside vertical baton that is in the first primary position. Use the holes in the vertical 2x4 baton as a guide to drill holes through the EPS at the X'9" positions and also at the 4" from bottom position. Once you have the holes, fit threaded rod, washers, and conduit through to the insider 2x6 corner assembly. In all the locations where there will be a vertical baton, add the treaded rods with the washer and conduit. Add a vertical baton on the wall outside. It is good to temporarily add an internal vertical baton the tie rod in the exact right location. Tie the tie rods to the horizontal rebar. As you gradually add horizontal rebar it becomes more necessary to support the threaded rod to stop it bending down. Full height vertical 2x4 batons do this nicely but can get in the way of adding the horizontal rebar. If there is a danger of the threaded rods bending down, you need to keep adding and removing the vertical 2x4 batons as you add horizontal rebar. Sometimes you are able to thread the rebar in from the end and thus avoid temporarily removing a baton. Certainly as soon as you have all the rebar added you need to add the vertical 2x4 batons in their final positions along the wall. They sit against the nailed down kicker boards and on appropriate thickness wood shims. Also horizontal bracing is added to hold them the right distance apart. The net result is that all the threaded wall tie rods are held accurately in their right locations. Use 8.5" lengths of 1/2" studding. Fit two nuts and a washer on the protruding end and lock them together using a couple of spanners. Fit the studding assemblies that provide the anchor from the window and door cavity bucking into the concrete. In the case of the top and bottom of the bucking you will choose which holes to use to avoid the wall ties. The studs are glued into the cavity bucking using PL-Premium adhesive. Squirt it into the hole and then push in the stud. Any unused holes in the cavity bucking can be filled with foam gap filler, although this is not essential.